Born to a prominent family in Cuba, Emilo Sanchez (1921-1999) moved to Miami as a boy, partly due to the instabilities in Cuba. His strong ties to Cuba during his upbringing in the United States began a life-long dual relationship with both cultures, evident throughout his career. While his primary studio was in New York, he did not care for the light or cold in the city during the winter months and spent that time traveling around the Caribbean to sketch outdoors. 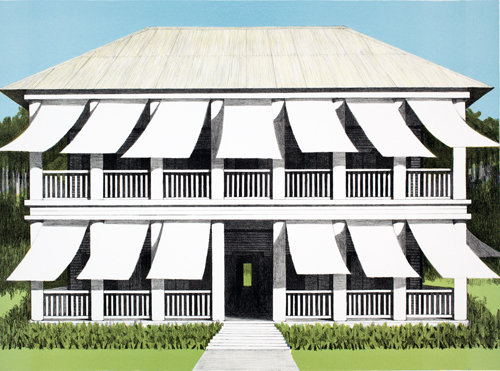 Sanchez began working with his well-known architectural subjects in the 1960s when clients in Cuba commissioned paintings of their plantation houses, which led to other house and architectural portraits that he continued throughout his career. The portraits are not precise renderings of the buildings and houses, but reinterpretations with personal elaborations that show his fundamental concern with the effects of light and shadow. Sanchez simplified the subject to its essential form in relationship to light and color, eliminating extraneous details, and achieved a natural abstraction through his selective vision. Although parallels are drawn between Sanchez’s work and other North American artists, Sanchez is set apart by his Cuban heritage. 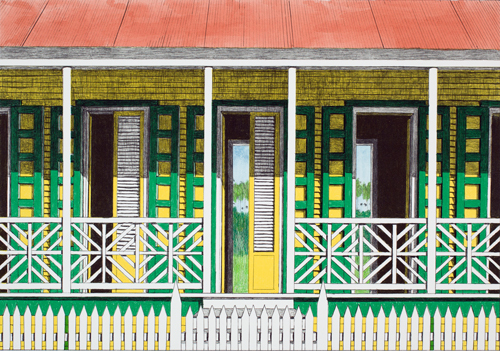 Luz y Colores: Emilo Sanchez’s Caribbean highlights the artist’s investigation of the effects of light and color with Caribbean architectural themes.